A fully remodeled, well-designed luxury condo that provides everything you need for a relaxing vacation: comfortable, high-end furnishings, updated appliances, ample kitchen supplies, great TVs in all three rooms, and the perfect top-floor lanai setting. 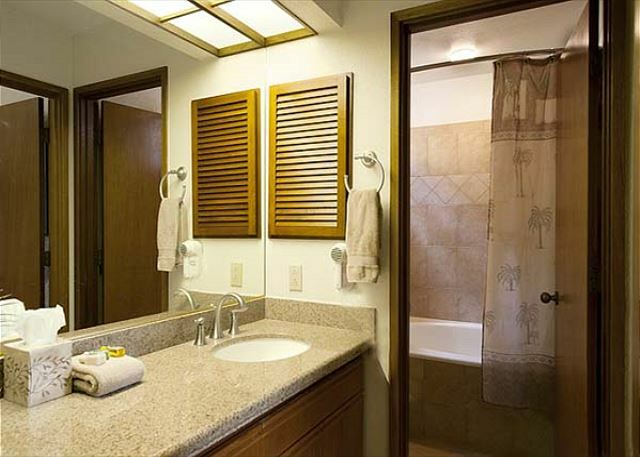 You will find this to be a practical spot from which to explore attractions located nearby and throughout the Big Island. The peaceful Shores complex lies central to two major golf courses, open-air shopping malls including a full-service grocery store, two world class hotels, a sandy beach, and interesting historical sites. 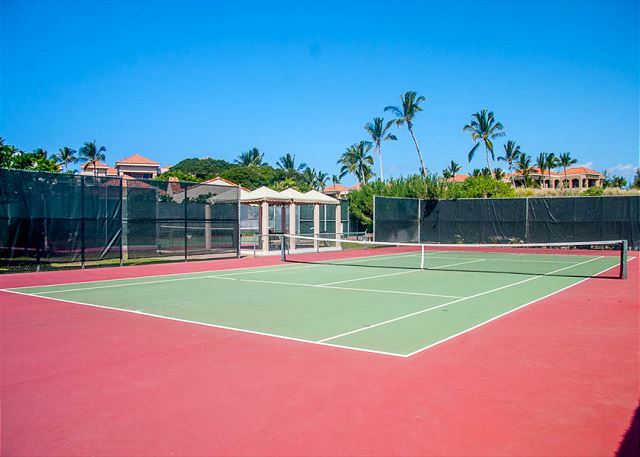 From this prime location you can stroll through a scenic pathway to Anaehoomalu Bay (A Bay) beach, where charter cruises, ocean sports, sunbathing and sunset-watching opportunities abound; or to a luau over at the nearby Hilton. Or you may enjoy browsing through shops or enjoying some outdoor entertainment at the Kings' Shops, also accessible within a pleasant walk or a short drive. This condo has been impeccably maintained and features plush Tommy Bahama-style appointments made for comfort, accented by vintage Pacific Islands art to enhance the island mood. It is well-suited for either a small family or two couples, with plenty of privacy within the second bedroom-bathroom area. There is new tile flooring throughout the main living-dining area and fine carpeting in the bedrooms. The master includes a large en-suite with a spacious walk-in shower and double vanities. The lanai offers an ideal spot for outdoor dining or cocktails while looking out to the property's vibrant tropical landscape. Recent improvements include a brand new oven and microwave, a new queen bed in the guest bedroom, a beautiful wooden desk, and more outstanding art. There are various beach items included and additional items may be available upon request. Excellent condo. Well decorated and clean. Corner unit very quiet and large lanai. Definitely would stay again. Thank you very much. The owner will continue to keep this unit well-maintained and updated. We hope to have the pleasure of accommodating you for a future stay. This was a real gem! My husband and I stayed here as I had a conference at the Hilton Waikoloa and vrbo Gave us more space and better price. This condo was amazing- great space, easy walk to beach and Hilton. The bathroom/shower was really large and helpful for getting ready after the beach. The lanai is a dream- it’s huge. I loved this place and would stay again anytime! Thank you very much -- it was a pleasure to work with you, and we hope you can return for a future visit. Amazing accommodation for the perfect vacation! My husband and I stayed here while visiting family and our stay was absolutely perfect! The condo was clean, comfortable and spacious. The kitchen was stocked with everything you need to cook and we were easily able to host our entire family over for dinner one night. We loved sitting out on the beautiful patio for our meals. Check in and check out were both super easy and all instructions were very clear. The condo was a close walk to restaurants, shops, beaches, and the golf course. We didn't get a chance to use to the pool or hot tub but did check it out and it looked lovely. The landscaping of the grounds were gorgeous and we loved sitting and watching the koi in the ponds. Thank you so much for the perfect stay! Thank you very much. We are so glad that you enjoyed the condo and that everything worked out well for your family. Please come back and stay with us again! Thank you for your comments, and we so appreciated having you stay with us and hope to have you back! Beautiful place to stay, wonderful help from Peggy, clear instructions on everything, no scary moments...Great feeling that help was at hand if we needed it- we didn't. very happy. 6 nights. great location. great amenities. flexible check-in and check-out. great value. Very nice accommodations to relax and enjoy all of the local area. Very close to restaurants, beaches and out door activities all with in walking distance. Loved the lanai and the quietness the property offered. This is the perfect place for four adults. Large open rooms and nice relaxing views. Great location with close access to nice beaches. Very clean condo, quiet and well maintained. If I were going to move to the Big Island, this where I would look first. I will book here again on my next trip to the Big Island. The condo is actually bigger than it appears in the pictures. The lanai is L shaped with a perfect breeze and lots of birds. Vog was not an issue in Waikoloa. I highly recommend this getaway. It was a pleasure to accommodate your group and thank you for your comments. Recently the property was converted to an all-digital TV system and the changeover has been a little complicated. TVs are checked before and after each guest, but since we only had one set of instructions placed next to the living room TV, these have now been added to the bedroom TVs as well, and the old remotes removed. Condo was very clean and filled with all needs. Tasteful decorated and spacious condo in a great location. Walking distance to restaurants and beach. Quiet for a relaxing experience. Easy drive to north end of island. Hawi and ancient Hawaiian Village not to be missed! We thoroughly enjoyed our stay at The Shores. This condo is super spacious and well stocked. Our family uses VRBO rentals almost exclusively unless we are just staying a night or two. We have stayed in many VRBO rentals and this one is at the top of the list for value. There was plenty of comfortable seating and the beds were very comfortable as well. I loved having two separate bedrooms and 2 full bathrooms along with a full kitchen that was stocked well enough for us to prepare nice meals. 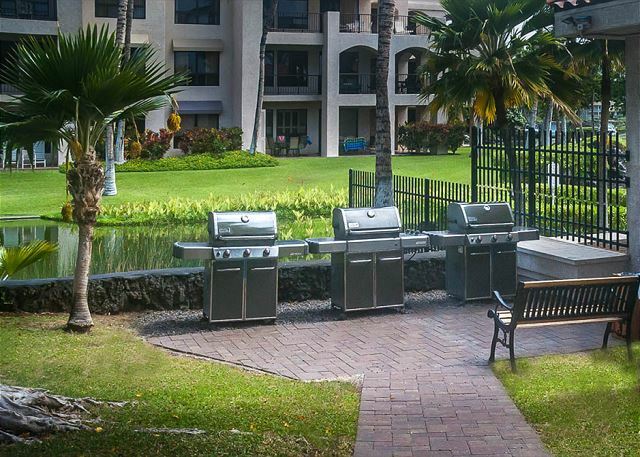 We ate on the lanai several times, and the condo is close enough to walk to several restaurants in the area. The pool/hot tub on site were awesome as well. My son loved swimming in the pool every day. My husband also utilized the gym which was really nice as well. Overall, we enjoyed the island and the Waikoloa area very much and would definitely stay here again if we return. I do suggest to anyone staying here to go ahead and drive into Waikoloa Village and use the grocery store there - the prices were much better compared to the grocery stores located at the various resort areas. And while there is a beach within walking distance of the condo, we chose to go to Hapuna Beach State Park every day (about 8 miles away). It's a super nice beach and there was always parking available. I highly recommend this rental for groups or families. Reservations/communication throughout were excellent. The directions & map sent prior to arrival along with check in information was perfect. To have an assigned parking spot is wonderful & this one was especially nice because it was right on the end & marked for this condo. Step into this 2 bedroom, 2 bath unit & immediately you feel at home. It’s warm & inviting & especially comfortable. The kitchen has everything you’d ever need to cook a full meal, even some spices & coffee/tea supplies. This microwave is the easiest one to operate I’ve ever encountered. The dining room table & chairs were beautiful & the artwork delightful. There is a desk in the dining room to use to set up your computer. The living room very comfortable & the TV worked well. Ceiling fans in the living room & master bedroom provided just a touch of breeze when needed. I practically lived on the wrap around lanai with very comfortable furniture & the perfect place to enjoy your meals, a good book, a cup of coffee or glass of wine. The master bedroom had the most comfortable king bed & lots of closet & drawer space. The master bath has double sinks & lots of storage underneath. There is a huge shower with dual shower heads & lots of hot water. The washer & dryer is always a welcome addition-so nice to continue your travels or return home with clean clothes. In the entry there is a collection of great books, movies & a game to enjoy during your stay. At The Shores & for your use is a gym, tennis courts & barbecue areas. For golfers, you would be in paradise as the course is right outside the complex. You are a short walk to the rocky coast & the King’s trail thatgoes along the ocean’s edge for quite a way. You are very near A-bay which is a breathtakingly beautiful beach. Many restaurants, grocery stores & shopping reside within Waikoloa, even a movie theater. We’re already looking to return, LOVED our stay & Waikoloa & would return in a heartbeat. Special thanks to Peggy for everything! Excellent condo on top floor. Rental company was great and very responsive when we had questions. Unit was clean, well furnished, large lanai and plenty of room for two couples. We loved this condo and the location! The total experience was amazing. Peggy did an excellent job helping us find the perfect place for our Hawaii vacation! We were very impressed with how clean and lovely the condo was and you could not choose a better location within the resort. We love staying on the island and particularly at The Shores. Waikola Realty has been great to work with over the years. We will continue to return. The unit was very nice with plenty of room. Love the balcony! The place is great, it's on the 3rd floor, so it's quiet, and it's very comfortable. You can walk to the 'Tropics Ale House,' but it is a very short drive to everything else you need. The grocery store in the Queens shops just up the road is wonderful, and the 'Lava Lava Beach Club' at A bay is a great place as well. Everything went well. All directions were easy to follow. Property was in good shape and well stocked. Only issue was oven did not work and was not noted. We were very pleased with everything and would stay at that unit again. Peggy was very thorough and accommodating in allowing us a late check out. One of our favorite places to visit. A very peaceful location. Lovely furnishings, well maintained. We appreciate your nice comments and look forward to having you back for your next Big Island trip. We really enjoyed this property and the building is very well maintained. the ample deck is where we spent most of our time. The place is very clean. Just a couple of recommendations - the oven doesn't work - takes about an hour to get to temperature and when you switch to broil, the oven starts the pre-heat cycle once again and takes an hour to get to temperature. Sadly two meals were affected and unfortunately there is no bbq which would be an adequate back-up. Notified the property manager who said there is normally a sign on the oven to warn guests of the slow pre-heat time, however, the oven is actually malfunctioning. All other appliances are in good working condition and the wi-fi is very fast and reliable. The pool is just the right touch and the grounds and parking are impeccable. Very quiet and friendly place to stay. Thank you for taking the time to submit a review. We regret that we were not able to secure an appliance technician in time to repair the oven before your remaining two nights. We have provided a discount which will hopefully make up for the inconvenience and any lost food. The condo was spacious and nicely appointed. The kitchen had everything we needed (we cooked most nights), and the washing machine & drier were well used! It also had some board games, pool toys and boogie boards available to use which was great for our children. Plus some good books on the area which came in handy for site seeing. We wouldn't hesitate to stay here again, or recommend to others. This was our second visit to The Shores - booked through Waikoloa Realty Inc. We were again staying in a 2 bedroom apartment for two weeks - this time in the Banyan Tower but we preferred the view last year from the Golf Villas (which were this year unfortunately already booked). But overall we were very satisfied again. We loved the large lanai and spent many hours in the morning and evening there. The condo was very spacious, clean and well appointed. The Wifi worked perfect! Having a washer and dryer was wonderful! The grounds were beautiful, well kept and very quiet. Definitely would stay in the Shores again and I can also recommend booking through Waikoloa Realty Inc.